If you have any questions click on the E-mail link. Click on any image for a larger view. It seams like only yesterday when if you wanted a small concealable firearm for personal defense or backup you chose a 38spl. It was offered in steel or alloy, but we all knew the alloy guns didnâ€™t last like their heavier brethren and they could not handle the hotter +P ammunition that was becoming popular. Sure you could get a 32 or 22 in a nice little revolver, but it was the 38 snub that dominated the market. Then as we approached the 21st century and the dawn of a new millennium a couple of innovative companies started throwing high tech words and phrases at us. Words like TITANIUM and phrases like MULTI-ALLOY. The last time we felt this awe and wonder over a new and revolutionary metal for firearms was 37 years ago in 1965 when the first stainless steel revolver was introduced, coincidentally it was a 2" 5 shot 38spl. Leading the pack in this world of exotic metals and alloys is Taurus International. With corporate offices located in the diverse city of Miami, Florida and production facilities located in exotic Brazil, it is no wonder the company looks beyond the norm. Taurus first stunned the marketplace with the introduction of the TOTAL TITANIUM concept. Yes a revolver made entirely out of titanium, except of course for a few little things like grips and the pivoting surfaces. 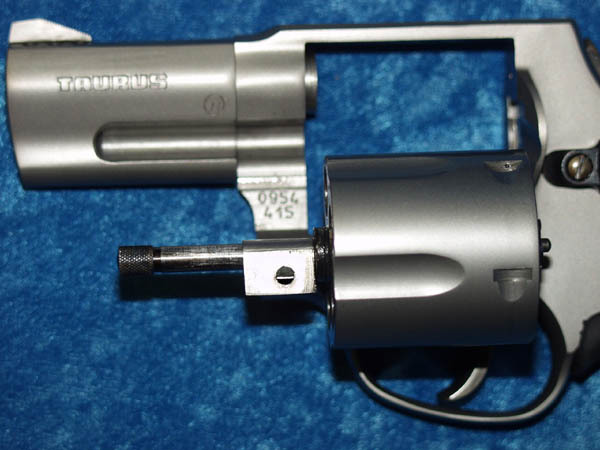 In a market place where the competitors were only using titanium in the cylinder, Taurus provided a Cylinder, barrel, and frame of titanium. These new metals and alloys have reduced the weight of our heavy-duty steel snub-nosed revolvers while at the same time increasing their strength. 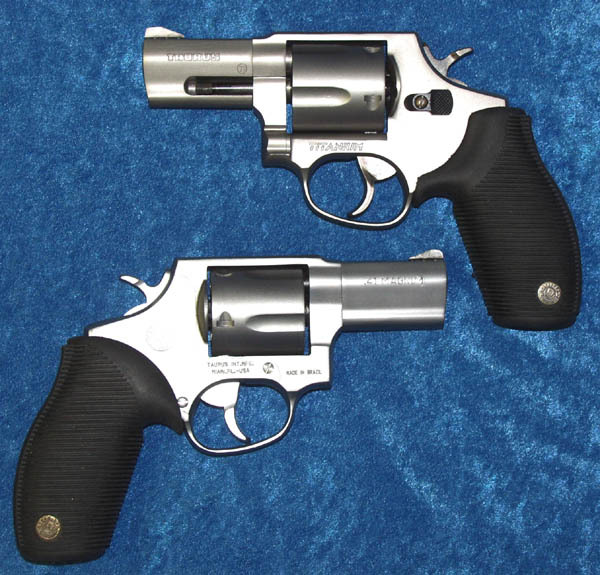 It is not uncommon these days to hear of these highly concealable firearms chambered for such cartridges as 357MAGNUM, 41MAGNUM, 44SPECIAL, and even the venerable 45 Long COLT. 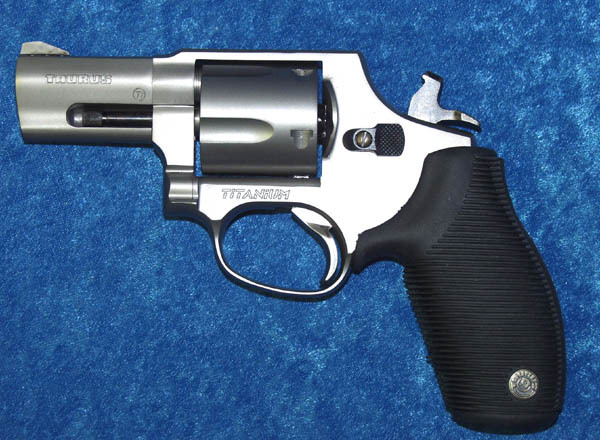 Taurus has even introduced a 7 shot 357 MAGNUM snubby weighing in at just over 1 pound. As I opened the first box, titanium 41 MAGNUM finished in Shadow Gray, my first impression was that this is a good-looking revolver. This was the model 415T. The bead blasted matte gray finish of the frame, cylinder and barrel was nicely offset by the blued cylinder release and the case colored hammer and trigger. 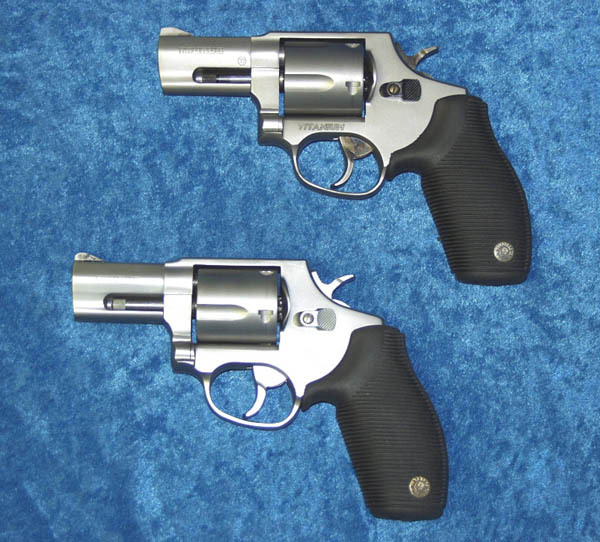 The Taurus revolvers in the larger calibers, 41, 44, and 45 are all 5 shot. As I removed the revolver from itâ€™s case the word WOW came to mind. The feeling was amazingly light. Many of the current Taurus products are shipping with a new pliable grip design. This soft ribbed grip is part of the Taurus recoil reduction system. In combination with the factory-ported barrel this system reduces felt recoil and muzzle flip by as much as 80 percent. These are very important features in a lightweight 2 1/2" big bore Magnum revolver. The model 415 was in my second box. This is the matte, all stainless steel, 5 shot 2 1/2" snub-nosed powerhouse. The Taurus revolvers lockup just forward of the cylinder. 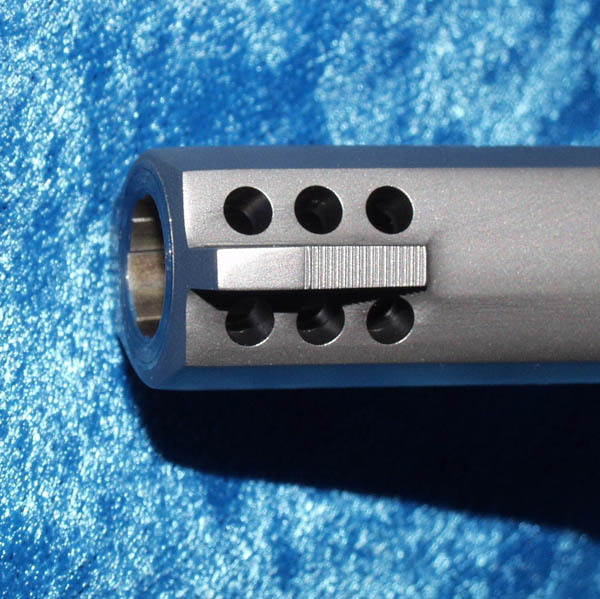 This assures proper alignment of the barrel and cylinder and contributes to the revolvers fine accuracy. At the range both of the 41 Magnum revolvers would be shot with Winchester 210 JHP, Winchester 175 Silver Tips, Remington 170 JHP, and my own cast hand loads (215 SWC over 7g of Unique). The cast load was a pleasure in both firearms. However, when it came to the factory Magnum ammunition these little powerhouses did produce some recoil. The all stainless steel model 415 was controllable with all loads. 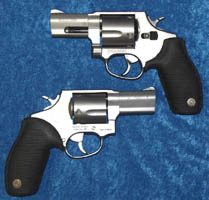 The combination of the ported barrel and the soft ribber grips put this firearm on par with a medium frame 357 snub nose. The Total Titanium model 415T is not for the novice shooter. At a mere 20 ounces, recoil with all factory loads was stout. This firearm can be easily handled by anyone used to the big magnums or handgun hunting. Both revolvers turned in very good groups at all ranges. 5" rapid-fire groups at 7 yards were achievable with all loads in both firearms. If you need power in a small lightweight package, the new line of Taurus revolvers is the answer.